Here are some GMA Chaser certificates that have just been forwarded to me….. It was a good morning. 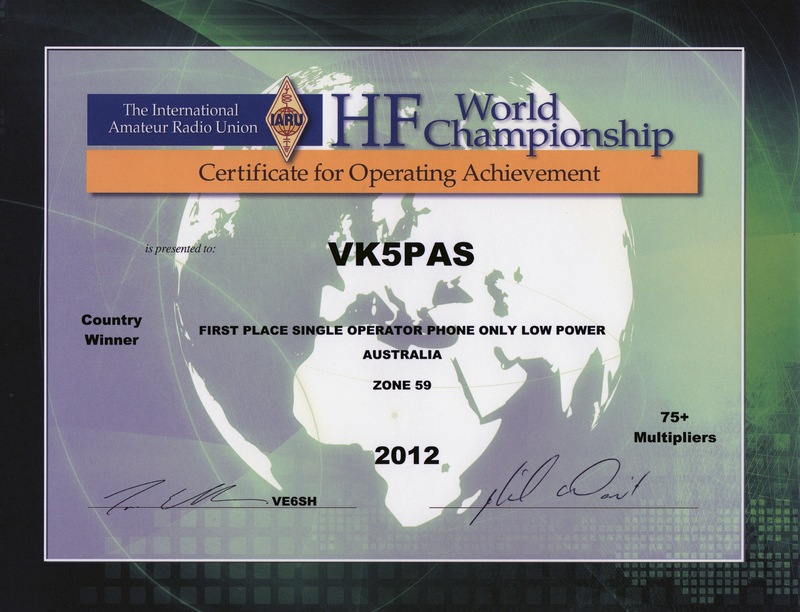 This certificate was also in the post from the 2012 IARU HF World Championships. Yes, 2012. It takes a lot of time to check the contest logs. Another pleasant surprise in today’s mail was my certificate in the 2014 John Moyle Memorial Filed Day. 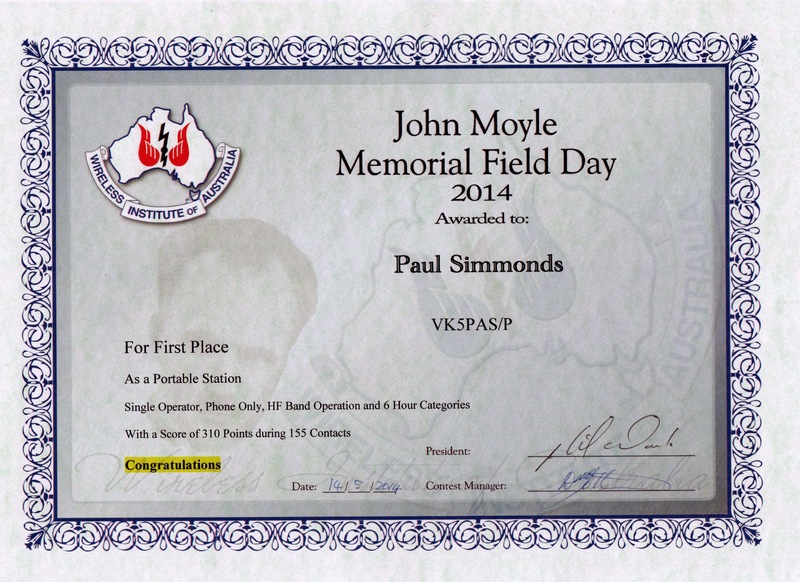 I received a certificate for first place as a portable station in the ‘Single operator, phone only, HF band operation and 6 hour categories’. Although it was a wild, wet, and woolly day on the top of Mount Barker, it was a lot of fun, and I will definitely be competing in next year’s Field Day. I was pleasantly surprised this morning when I went down to the post office. Amongst the bills, I had a few QSL cards, a batch of QSL cards forwarded to me by Tony VK3VTH to check for DXCC, but I also had a certificate from Andrew VK1NAM. Greatly appreciated Andrew. Andrew and many others have set a high benchmark for SOTA and have certainly formed a strong foundation for the program here in Australia. And now Andrew has been hooked on WWFF. Again thanks mate, and look forward to working you when either your or I, or maybe both, are on a SOTA peak or in a National Park. Last night I had a bit of an issue with loading a csv file with my Chaser log from the SOTA website. So I sent off an email to GMA and was promptly answered by Mario DL4MFM, who was kind enough to reformat the file for me. This morning I successfully uploaded it to the GMA website. Here are my Chaser stats…..
My top 25 chased activators consist mostly of VK1s & VK3s, with Ian VK5CZ creeping in at number 8. Mike 2E0YYY appears at number 13. 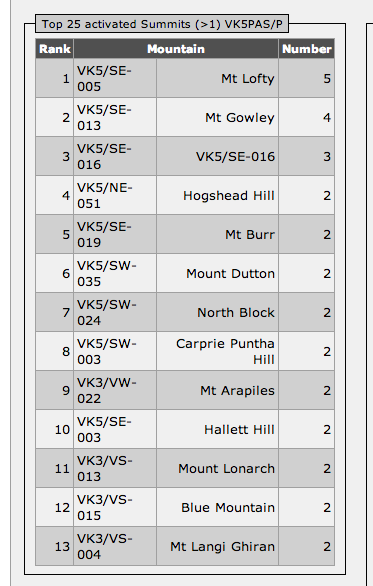 As you would expect, Peter VK3PF (Australia’s 2nd Mountain Goat) appears at number 1, followed by Allen VK3HRA. 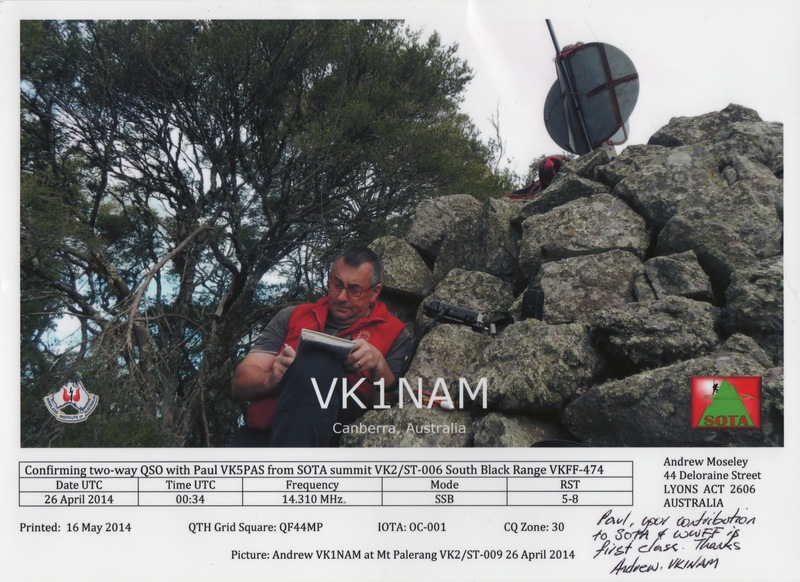 Andrew VK1NAM appears at number 3 as VK1NAM/p and at number 12 as VK1NAM/2. The SOTA website only shows your top 10 chased activators. I did notice some discrepancies here with statistics from the GMA site and the SOTA site. This is due to the different point scoring system within the GMA. And here is a list of my top 25 chased summits. Mount Gowley is actually Mount Gawler. The SOTA database was corrected some time ago and I have advised Mario of this issue with the GMA database. Mount Taylor in Victoria is certainly a very popular summit for activators. The GMA website shows your top 25 whereas the SOTA website shows your top 10. Again, I noticed some discrepancies here between the GMA stats and the SOTA stats (due to the point scoring system). Here is a little bit more info on the German Activity Group (GMA). On the Stats page, in the red area in the left hand column, you can view your Activators log, a list of GMA activators ranked by points (see the image below), a list of GMA activators ranked by QSOs, a list of GMA activators ranked by unique summits, and a summit 2 summit ranking. There is also a Globetrotter list (similar to the SOTA Mountain Hunter), and Regionhopper list. And you can also click on your own call sign (this is the last option in the top red box). This will bring up some interesting individual statistics including a breakdown on your activations and points, activated associations and activated regions. My GMA score as an activator is 370 points and my SOTA score as an activator is 153 points. This is due to the difference in point scoring as mentioned in my previous post. The ‘top 3 most QSO’ stats interested me. This showed that my activation of Moun t Gawler, VK5/ SE-013 on 12th January 2014 produced my most number of QSOs. A total of 61 in fact. This was closely followed by my early activation of Tothill Range VK5/ SE-010 with 55 QSOs, and in third place was another activation of Mount Gawler in April 2014 when I managed a total of 54 QSOs. The highest number of QSOs per activation was in the 20-29 QSO bracket. And this was preceded by the 10-19 QSO bracket. My average operating time was 68.4 minutes on a summit, with a total operating time of 76.4 hours which equates to 3 days and 4 hours. Geez, I can’t believe I’ve sat on the top of hills that much. I would love to see some of the stats from some of the SOTA gurus in the eastern states. In all, I had a total of 1,640 QSOs as an activator, with 1,420 of those being on 7mhz on 40m, and a total of 220 QSOs on 14 mhz on 20m. So 86.6 % of my QSOs were on the 40 m band, followed by 13.4 % on the 20 m band. There is also an event called the GMA Triathlon, which appears to be a combination of your SOTA activities, World Wide Flora and Fauna (WWFF), Castles on the Air (COTA), Islands on the Air (IOTA), and Lighthouses. I am still looking at this to work it out fully. A little lower down on the Stats page, in the orange area, if you click on your call sign, you can view various personal call sign statistics. Those stats include your total activations, the number of activator QSOs, your activation modes, and your unique stats. There is also an average column which shows the average for activators who have uploaded their logs to GMA. And a total column which shows all the totals for activators who have uploaded their logs to GMA. There were some interesting stats on the GMA site which you cannot see on the SOTA site. 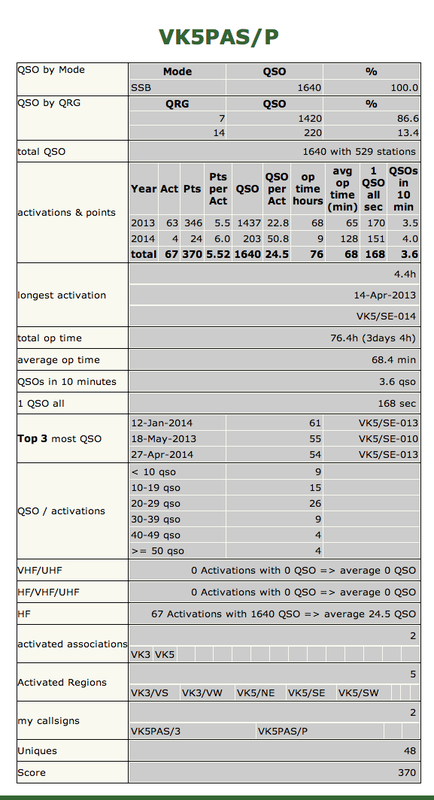 For example, the total number of activator QSOs and the average number of activator QSOs per activation. 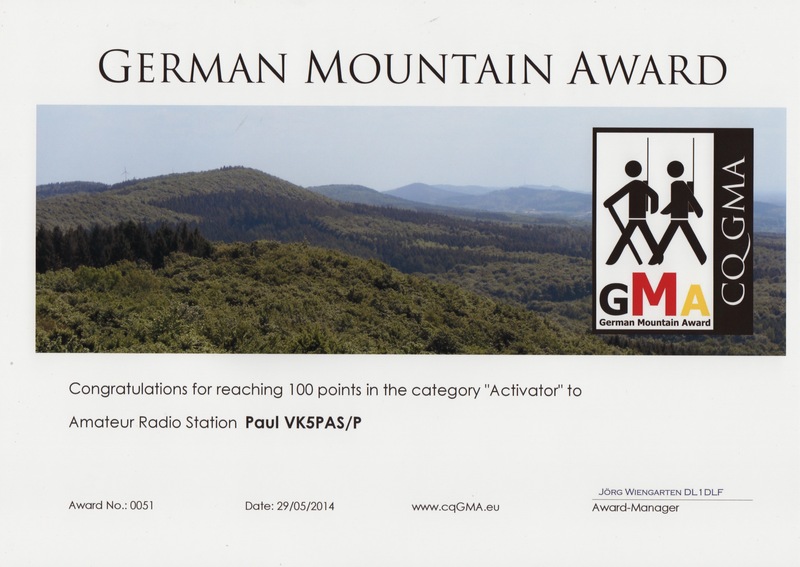 In my case I had a total of 1,640 activator QSOs with an average of 24 activator QSOs per activation. All of those were on HF SSB. I really must make the effort of taking the 2m handheld to the top of Mount Lofty one day, and also give CW a go. Furthermore, the stats showed that I had 11 unique activations in Victoria with a total of 374 QSOs and a total of 37 unique activations in South Australia with a total of 1,266 QSOs. My total activation count was 67, however, 48 of those were unique. This goes back to the problem of submitting 2 logs across the UTC rollover, which I now still has some heated debate. And activation of the same summit within the calendar year. You can also view the top 25 chasers that have worked you. The SOTA website statistics only list your top 10 activation chasers. This matched the stats on the SOTA site. And also the top 25 chasers who appear in activator logs that have been uploaded to the GMA website can be viewed (worldwide). Here are my top 25 worked chasers, a mixture of VK1s; VK2s, VK3s and VK5s…..
You can also view your top 25 activated summits and the top 25 activated summits from all activators. On the SOTA website, your statistics will only show your top 10 activated summits. Other than the Mountain Award (MA), there is also the Mountain Challenge (MC) which is an annual competition where the winner is the participant who has achieved at the end of the contest period, the most points. The contest period is defined as 1st January at 0000 UTC to 31st December at 2400 UTC. Each participant with more than 50 points will be awarded a certificate of participation. If you have achieved the 50 point threshold, your total appears in red. Again, you can view a table of your progress. 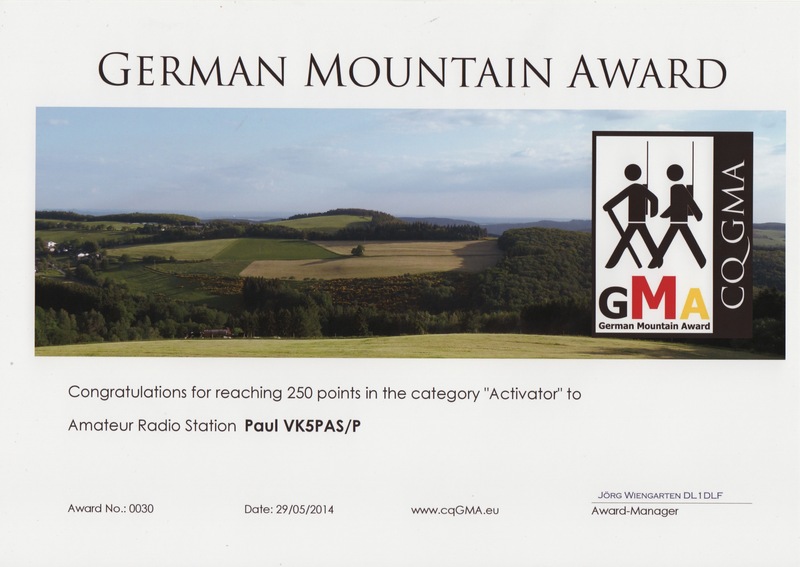 Tonight I was looking at the Adventure Radio mapping project and found the German Mountain Activity Group website which is located at….. The scoring system for GMA is different to that of SOTA. In GMA a summit is definable when it is 100 metres or higher. Each full height of 100 metres is awarded a point. Examples: 120 metres = 1 point, 700 metres = 7 points, 1299 metres = 12 points. After looking at the site I realised that I was eligible for some award certificates.